I was lucky to get this radio for 99p on Ebay, nobody else seemed to want it! There was nothing wrong with it that could not be rectified with a good clean and judicious use of switch cleaner. This is the less common B version, which relates to the trim and does not denote any electrical difference. It has a cream coloured cabinet and brown leather look sides and brass trim. 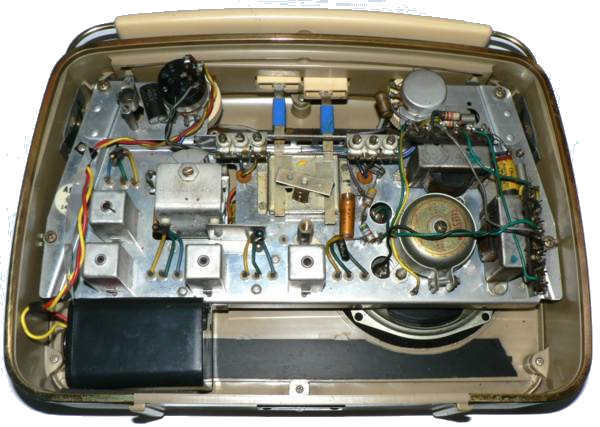 Later versions of the TR82, used the less reliable AF series transistors. Transistors may be expected, under normal operating conditions to have a much longer life than valves. If, however a transistor should need be replaced, this must be done by your dealer. Transistors cannot be plugged in like valves and for the purposes of servicing the must be treated in the same way as other components. 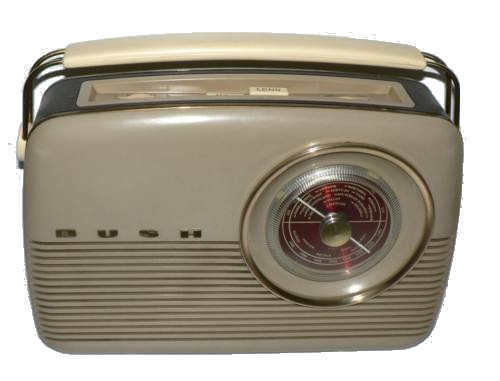 I was puzzled by the circular indentation on the lower right of the back panel and discovered that this case was designed in 1957 to house the Bush MB60 5 valve mains/battery MW/LW portable radio. This case designed by David Ogle was used for many years and is perhaps the most remembered British transistor radio. More recently the design has been resurrected and used to house a modern set including a VHF band. 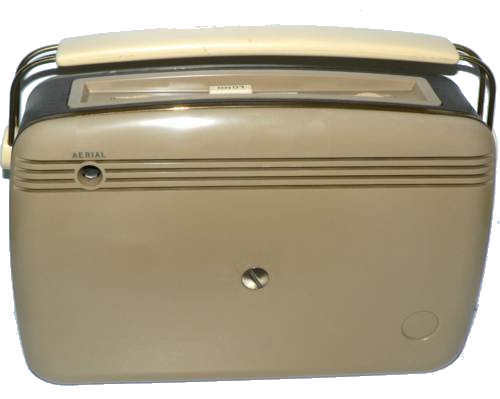 Note that the ventilation louvres required for the battery radio have been sealed with black tape. The white circular disc on the aluminium chassis has the chassis numbers A177 11742. The pushbuttons actuate a conventional rotary wafer switch. Martin J. Pratt who is a Director of R&M Rentals Ltd recently contacted me to say that his granddad Robert J Sprules who worked for Bush before and after WW2 designed the circuit for this model. Sadly he passed away in 2013 but was still repairing the odd TR82, he was 92. Martin has a number of working examples of the TR82.